Wow! We got so much accomplished since last week. We pretty much have a functional basement space now!! I haven’t had a chance to take my camera down here and shoot some nicer pics, so for now you’re going to have to deal with my grainy iPhone pics for a little longer. If you haven’t already, be sure to Check out Week 1, Week 2 and Week 3. First up – the fireplace is finished! The mantel was installed Monday and all the most of the painting was finished last week. What a transformation from the before, right?! 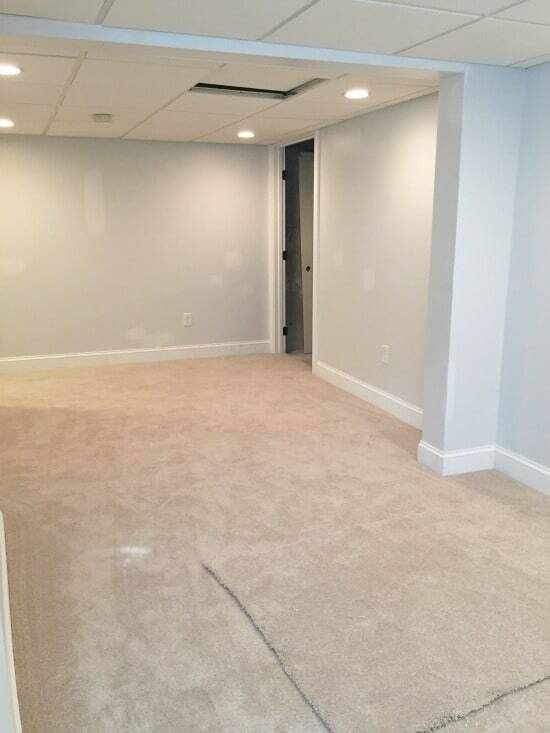 The walls have been painted, recessed lighting installed, CARPET installed and the drop-ceiling in the playroom was finished. The trim has been installed but along with many other areas, still needs to be caulked and a coat of white trim paint needs to be applied. Any imperfections in the drywall need to be fixed and repainted, too. The electrician needs to come back and tidy up a few things as well as install a dimmer on the recessed lighting. The exposed copper pipes are also in the process of being covered up. Most of my furniture (minus the couch and a large credenza) have arrived! You guys, the quality of the furniture from Raymour & Flanigan is amazing. AND you can buy online. This stuff is sturdy, all solid wood type furniture.It can be nerve wracking buying furniture online (I’ve have MANY bad experiences when it comes to quality) but you can trust that their furniture is top notch quality. They also have a GREAT decor section and I picked up an amazing mirror that I’ll share with you next week. It is also REALLY HEAVY! The delivery guys had a hard time getting it all in the house and down the stairs! Again, apologies for crappy iPhone pictures. The furniture is STUNNING in person and I can’t wait for you guys to see everything set up and styled. Oh, and I also bought a new rug and some pretty decor items from Target! You also might have seen on Instagram that I some artwork arrived via Minted. How stunning are these pieces? They came framed and ready to hang which means one less thing I have to buy. Thank you for sponsoring them, Minted! While the room(s) look like they are ready to be furnished and styled, there’s still some work to do. Like I previously mentioned there’s plenty of touch-ups – caulking, spackling, painting. The vents have to be installed over the copper pipes, the electrician has a few random things to fix. Of course, I’m still waiting on more furniture items, decor pieces. AND I still have tons of decorative items to purchase in order to adequately stage the space! I can’t wait to share more next week! In the meantime, follow me on Instagram and Facebook for updates and make sure you’re subscribed via email to get updates direct to your inbox! Hi, Love all the pictures from your renovations in your house. I want to paint my red brick fireplace as well and wondered what white paint you chose? There are so many whites and different paints. It’s hard to know what to use! Appreciate any feedback you have. I was also wondering about painting the inside black but it sounds like a lot of work. Thanks for sharing your house with us! Hi Ruth. Thank you for your kind words! We used Sherwin Williams Masonry Primer on the entire thing and then painted with an off the shelf white satin paint and the insert with an off-the-shelf black. It’s a very quick process! OMG what an amazing transformation already! 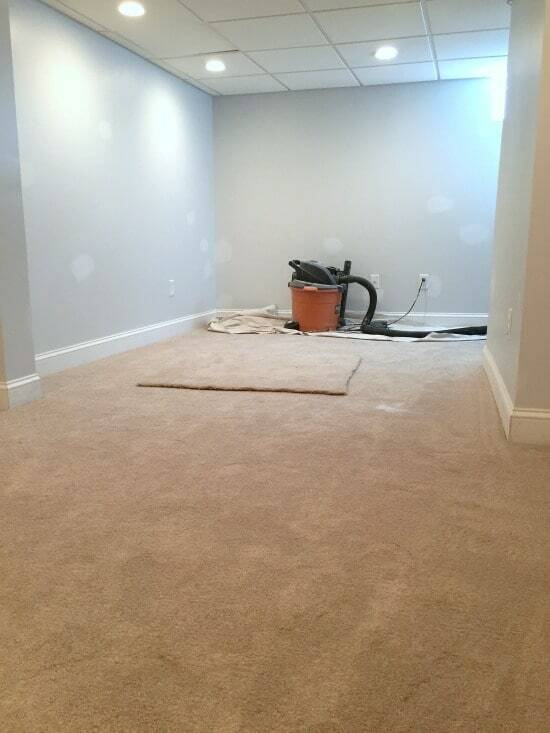 Having this light and bright living space in the basement is going to be so great for your family! Oh my word Jenna! 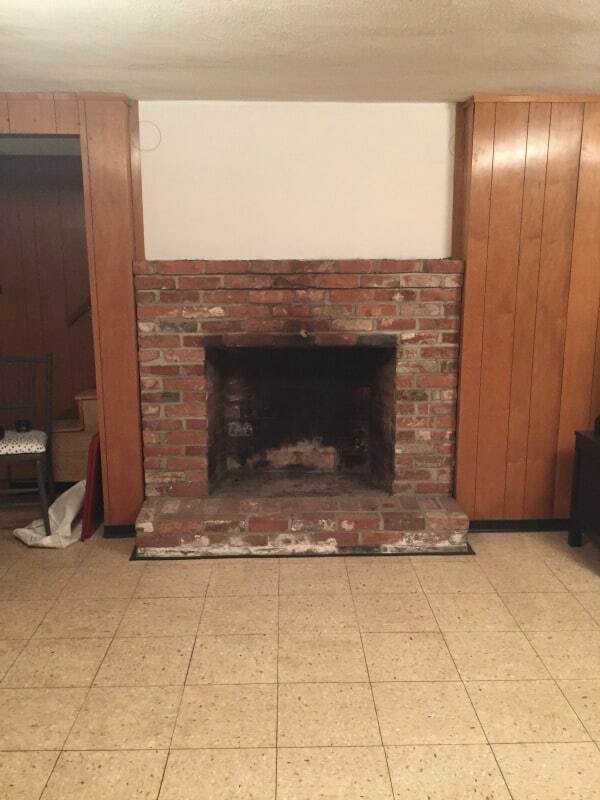 The before and after of that fireplace. I love it! Love everything you’ve picked out can’t wait to see the final reveal! Jenna, I can’t believe how quickly you are moving!! Absolutely obsessed with your fireplace. I’m excited to see your art in place too; the before and after is going to be amazing! You have already come so far!!! Everything looks amazing! Yay! Oh it looks so good, Jenna! I’m loving the clean fresh walls and the lighting is such a great choice. I can’t wait to see it all come together after you style everything ! Wow! It looks amazing and bright! Love those sconces! I’m having trouble even comprehending that this is the same space! It’s all looking incredible, but the fireplace might be my favorite. Jenna! What progress you have made! I love the fireplace. Such an updated look with the new mantle design. Great job this week!!! Wow, you’ve been busy!!! I’m over here barely keeping up with furniture deliveries… LOL Love your choice of paint; our entire house is a soft shade of gray, and I’m obsessed with it. What a score on those sconces, too! A few months ago I considered something very similar for our guest bathroom but then decided to go in a different direction. Oh, and can’t forget to comment on that fireplace! That has got to be my favorite part of the project thus far. We just recently started on ours, and I am DREADING the process!!! Can’t wait to see all your new furniture! Looks great! What a change already. Light and bright!